LAUNCH is the new name for the Carolinas Credit Union League’s annual expo for credit union professionals with a mindset for innovation, growth and collaboration. 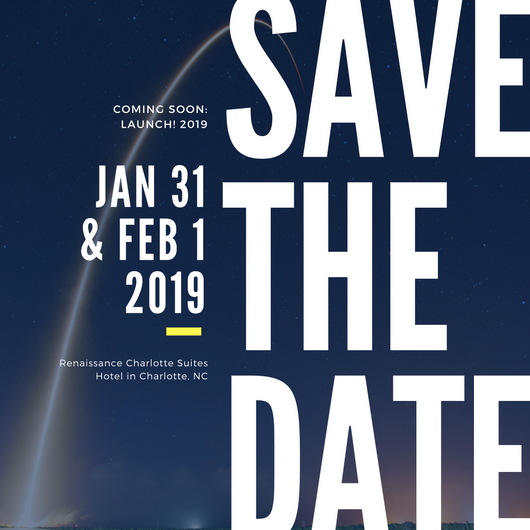 The event will be held January 31 – February 1, 2019 at the Renaissance Charlotte Suites Hotel in Charlotte, NC. The expo, which is entering its third year, remains the “one-stop shop” where attendees can benefit from more than a dozen educational sessions, hear from several industry experts, and discuss solutions with numerous credit union-focused suppliers and advisors with the know-how to move your credit union forward. The one- to two-day experience is designed specifically for credit union professionals in all areas of expertise including executive management, operations, sales and service, marketing, compliance, information technology, and more. What to Expect at LAUNCH! Day 1 – Pre-expo events include small and mid-size credit union roundtables, Protégé Mentor Workshop, and the 2018 Foundation Awards Gala. Day 2 – LAUNCH takes off with breakout sessions, all-day access to the exhibit hall, the 2019 CUaware Protégé Competition Finals & Breakfast, and the Leadership Luncheon (by invitation only). Since this conference began in 2017, the League has welcomed over 200 attendees each year and looks forward to continuing the momentum. Take advantage of this unique opportunity to network with peers from across the Carolinas and learn how they meet the challenges of today. Mark your calendars and we will see you there!